Professional poker player Phil Galfond installed the slide after purchasing and combining two units in this East Village building back in 2008. (He won the world series of poker the same year). The home went on the market in 2012 and apparently only one potential buyer asked about the cost of removing it (the rest enjoyed testing it out - from single professionals to young families). According to the NY Daily News piece, "One man in his 70s who lives in Miami sent his broker to look at the apartment, wondering if the slide hole was big enough to fit his large dogs down it." You can read more here. 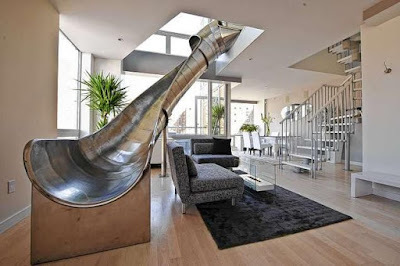 And in case you missed the staircase slide, you can view it here.